Nintendo Labo is still for kids, and still something that requires you to be excited about cleverly-constructed cardboard contraptions. The new Vehicle Kit coming out in mid-September, however, is also more of a fully-fledged video game. The original Labo releases last spring were as neat as they were slight. Called the Variety Kit and the Robot Kit, they enabled players to turn their Nintendo Switches into fishing rods, robot suits, and pianos, but then only let players try a small number of mini-games with each. The Vehicle Kit, which I tried in a hotel meeting room in New York City this morning, is different. Its main offering is a relatively sprawling thing called Adventure Mode. That mode lets players explore a large landmass full of themed zones while switching at will from controlling a car, plane, or — where there’s water — a submarine. Each vehicle is controlled with a combo of cardboard Labo creations. All utilise a foot pedal that is comprised of some folded cardboard and the left Nintendo Switch Joy-Con controller. Each uses the right Joy-Con in conjunction with a cardboard steering wheel, a flight stick, or dual-wheel submarine controls. That right Joy-Con is sheathed in its own cardboard shell and treated like a key that can be removed from each control apparatus and quickly inserted into another, allowing a player to switch from driving a car with the steering wheel to flying a plane. Just remove the key from one, insert it into another, and the player’s character goes from driving a car on the ground to flying up into the sky. (A similar idea, minus the cardboard and plus much more advanced graphics, is the core concept of Ubisoft’s recent PlayStation 4, Xbox One, and PC release The Crew 2). The scale of the world is large but not vast, more Wii Sports Resort than Breath of the Wild. The game map shows 10 hexagonal zones, each greyed out from the start until the player drives to a gas station, fills up the tank and, by doing so, defogs the map and gets alerted to eight or so objectives. The objectives I encountered were basic, involving things like sailing my submarine into an underwater flag or finding and carrying lost cows back to a holding pen. A more challenging one that I noticed while flying over the mode’s city zone seemed to involve having to fly over the top of a skyscraper, turn into the car, and parachute my vehicle onto that skyscraper’s roof. The zones are all themed. I flew over a city zone and unlocked a meadow. I drove past a desert complete with pyramids and, for a moment, had flashbacks to Banjo-Kazooie and Mario 64. Every vehicle has supplemental abilities. The submarine can fire torpedoes. The plan can shoot missiles. The car can…. throw bombs? Wait, this is kind of violent, no? The car can also deploy windshield wipers, a radio, or big horizontal buzzsaws that can cut down trees. All of these gadgets are triggered by buttons, levers and knobs that are part of the intricate cardboard controls that players will first need to build. To facilitate all these options, those builds aren’t simple. Nintendo estimates that the most complex one, the steering wheel could take between one and two hours to build. As with the other Labo kits, I didn’t see a hint of other Nintendo characters or lore. Your player-character is an androgynous, flattened crash test dummy. Your vehicles are cartoonish but don’t closely resemble any Arwings or F-Zero race cars. You can spray-paint your character and vehicles, using — what else — a cardboard spray-paint can that rattles when you shake it. The can uses the right Joy-Con’s infra-red sensor to detect a cut-out shape that is held in front of it, then spray virtual paint through that shape for a stencil effect. The Vehicle Kit, which will sell for £60 when it goes on sale on September 14, will also offer some mini-games. There’s a simple multiplayer slot-car racing mode and a car battle mode that works best if a second player has their own cardboard wheel. Nintendo reps say that the Vehicle Kit will allow players to make custom controllers that perform the same inputs as the cardboard Labo builds, but it’s hard to imagine players being able to concoct a homebrew steering wheel set, given all the control inputs needed. 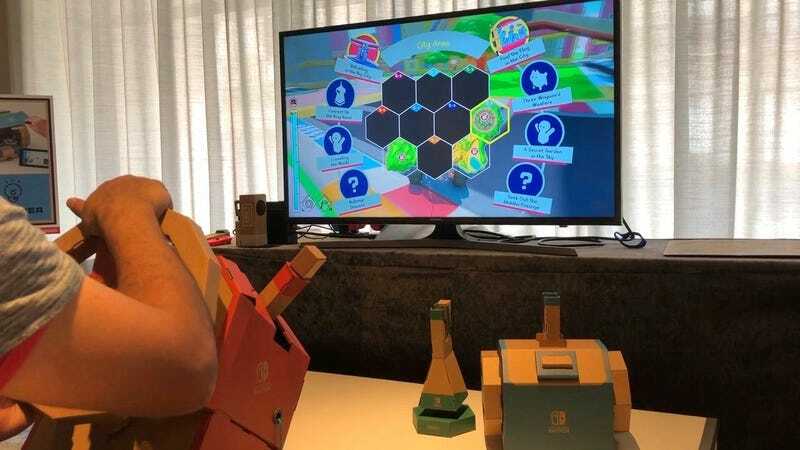 When I tried previous Nintendo’s previous Labo kits at New York press events, I left the sessions wowed by the ingenuity of the cardboard builds but sceptical that there was much more to these games to sink my teeth into. Vehicle Kit leaves me with a bigger virtual playground to explore. I’m not expecting the grandest of Nintendo releases, but I can see there’s a game with some heft here, one that I’ll need much more time to explore. Given what I and many Kotaku readers may be looking for from Labo, that’s a welcome development.